(you can log into the application with username “admin” and password “admin). Your jBPM Designer should be ready now for use after your server starts. In case you are wondering what we have been up to lately, here is a small presentation of some of the new things that will be included in jBPM Designer 6 release. 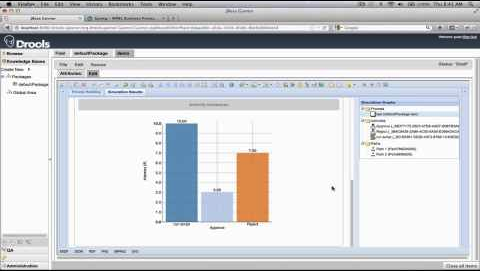 Here is a presentation we put together on Business Process Simulation in jBPM. jBPM has been an early adopter,supporter, and implementer of the Business Process Simulation Interchange Standard (BPSim). We believe that BPSim (which is a WfMC standard) will create a wide adoption of business process simulation in the BPM community, and are very happy to be part of that effort. With the BPSim version 1.0 recently released, we have updated our jBPM core engine, simulation engine (which is based on the core engine) and our tooling (jBPM Designer) to this latest version of the specification. If you are interested in learning more about BPSim and jBPM or just have any questions feel free to talk to us on our IRC channels. Here is the link to the jBPM Designer business process simulation capabilities that I posted before. We are adding new features and usability enhancements to it that should be out soon, so stay tuned. 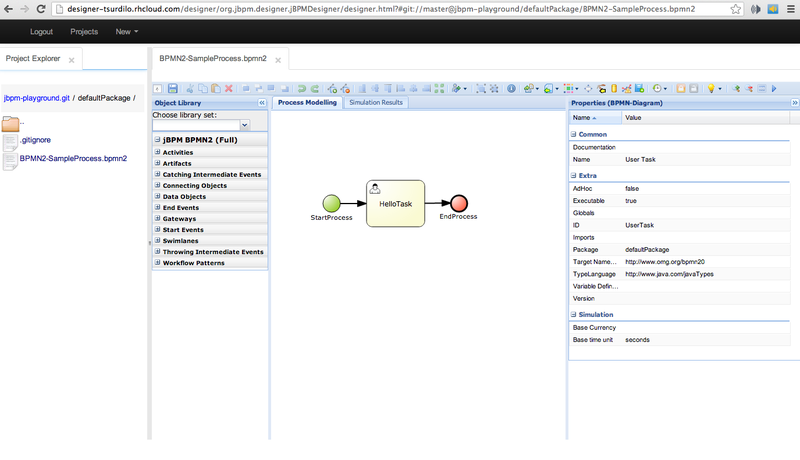 The new year is starting off with a big bang for jBPM Designer, the leading open-source web-based BPMN2 modeller. To explain, so far Designer has always been a BPMN2 editor module inside Drools Guvnor and all process assets created/generated by Designer have been saved to the Guvnor JCR 2.0 repository. Running Designer as a stand-alone BPMN2 editor was only possible in “read-only” mode, and integration with other systems was not easily achievable. This means that users are able to run Designer standalone, or integrate it much easier with their existing storage options as well as other development/design apps and much much more. Maciej Swiderski has written a great blog post on this, giving an introduction to the VFS implementation in jBPM Designer. Make sure to read it and give us your feedback. We will be blogging much more about this in the near future so stay tuned. As always remember that jBPM is open source so you can be involved and part of anything that we do so don’t be shy and contact us on IRC or the user forum and we will help you get started. Our community member Cristiano Nicolai has shared a great find and solution to an issue of generating the process image on OpenJDK7. Here is a link to his post and a link to the related OpenJDK bug report. We are very happy to announce a new release 2.4.0.Final of jBPM Designer, the Web-based Business Process Editor for jBPM 5. You can download jBPM Designer version 2.4.0.Final from Sourceforge. If you are upgrading from an older Designer version, make sure to clear your browser cache before start using the new one.